It's been a little over a year since my trip to Amsterdam. I spent three days there and made it a point to see as much as I possibly could and spend as less time in my lovely hotel room (read about my stay at the Hyatt Andaz Prinsengracht). So this really is a much delayed blog about the many things I saw and places I covered, and now highly recommend. Amsterdam is a city for Instagram lovers! Almost everywhere you look is postcard pretty and picture perfect. Doors are a beauty in themselves and old buildings have flora organically adorning them. You'll stumble past lovely plaques on the walls and will enjoy the strains of the violin from street musicians. Take a stroll inside the massive Vondel Park replete with idyllic lawns, ponds and footbridges; truly fairy tale like! Make sure you charge up your phone battery because I'm pretty sure you're going to be click-happy once you step out on the streets of Amsterdam. So much to savor, so little time. The stars of Dutch cheese - Gouda, Beemster and Edam, to name a few, have gained universal fame. Hence it would be a pity if you do not dedicate some time during your visit to taste the finest quality of cheeses. And you don't have to go too far to explore. Walk around the Amsterdam streets and you're bound to come across some lovely cheese shops; look out for Repeynaer, my personal favorites The Pantry and Cheese & More, and The Cheese Museum. The variety will amaze you. Lavender, Champagne, Truffle, Pesto and more. But beyond the cheese, the accompaniments of mustard and jams must also be given their due tasting. I really enjoyed the mustard assortments - try the ones infused with wasabi and honey varieties. These shops also have tasters so you zero in on buying just the cheese you prefer. To get into the heart of things, sign up for a cheese tour where you will learn about centuries-old cheese making traditions of the Dutch. I vividly remember my visit to the Alkmaar Cheese Market and Windmills way, way back in 1996. Also, beyond the windmills and clogs, Dutch cheese makes for the best souvenirs to take back home. The variety of cheese will stun you; we bought so many to take back home! Fear is a funny thing. I didn't say it: the creepy folks behind The Amsterdam Dungeon did. Well, would you like to do something different? Something scary? Something funny? Then look no further. Here is an 80 minutes immersive experience of Amsterdam's dark history dating back 500 years through gripping performances by live actors in costumes. They, along with the special effects will give you some chills and there's nowhere to run. From the time you walk in to the Dungeon, your experience begins right at the ticket purchase desk. It's murky in there and you don't get greeted by any smiles. A Gothic young lady simply issues you your ticket after which the Gatekeeper locks you up in a prison haunted by the ghost of its erstwhile vile occupant. Thereon, your dreary tour commences. Expect to be picked on by the actors - you may be the one suspected for witchcraft and burnt as the others in your group chant 'Burn the witch! Burn the witch! '; you may be on trial for fashion debauchery in court and ordered by the judge to do a little redemption jig for the group; expect to come face to face in a dark old pub with a knife-heralding Jack the Ripper as it thunders or even in arm's distance of a crazy doctor in his anatomy theater. I am not going to share more spoilers but I never before knew that fear and fun could so convincingly be put in the same sentence. This was one of the highlights of my visit. Oh and don't bother with the Madame Tussauds just next door. So you may not be the gallery hopping types or have much of a knowledge base in art appreciation, but surely you've heard of Rembrandt and Van Vogh! That in itself makes it worth hopping over to the two museums dedicated to the art masters. Let's start with Van Gogh. This is the only museum in the world dedicated solely to his art; it's got the largest collection of his works. Not only can you admire the brush strokes and colors of his famous works (such as the Sunflower, The Bedroom and Almond Blossom) but you also get an unparalleled glimpse into Van Gogh's life. As you move through the gallery and decipher his original letters to his brother Theo, through audio, you can also listen to excerpts from the many letters exchanged between the siblings. You get a sense of how much emotional and financial support Theo offered to Vincent through the many peaks and troughs of the artist's life. Then there's the dark part when you learn of the alleged self- mutilation of Van Gogh's ear and of his anguishing mental illness. The museum truly is an interactive experience where you get to know the artist. I recommending booking your tickets in advance as queues can be long. 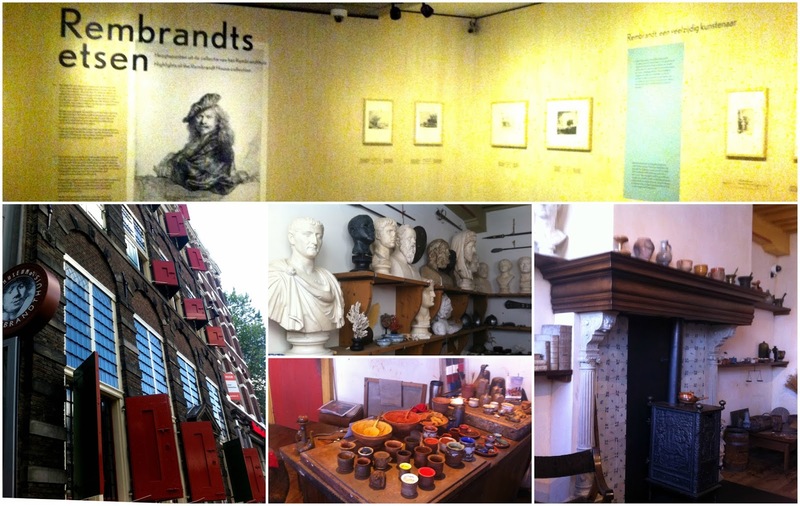 The Rembrandt House Museum too is worth seeing. Sandwiched between two traditional Dutch buildings, this structure is four centuries old and was home to Rembrandt from 1639 to 1656 at the height of his fame where he lived with his beloved Saskia. This very house was witness to his most defining sketches and to the traumatic times of his life: the death of Saskia and his three infant children. Rembrandt's house has been prudently restored with furniture from that era. I loved his bedroom, the kitchen space complete with old pots and pans, and his small but verdant courtyard. There's also the studio where he tutored many art students, and the room filled with his life's collections with fine and quirky artifacts. The museum also holds art workshops where they demonstrate how paint colors were created back in the 1600s. Name it and Amsterdam probably has a museum for it. There's the Tulip Museum (you can buy some tulip seeds here), Body Worlds Museum (not for the faint-hearted), Rijksmuseum (they have a stunning display of ancient pistols, vintage ballgowns, antique pianos, etc. 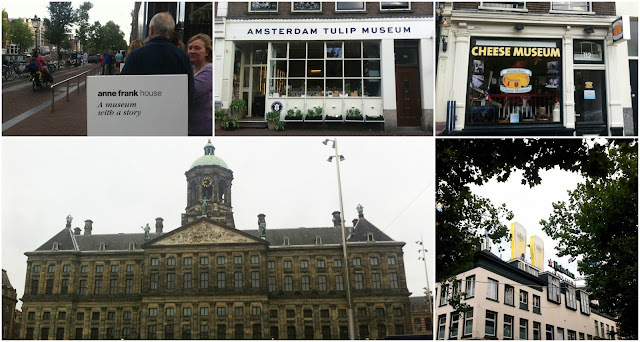 ), Diamond Museum, Heineken Museum (beer is serious business here), The National Maritime Museum, the Anne Frank Museum (read about my visit here), Canal House Museums, Royal Palace Museum (loved the old world charm of the palace chambers), Cheese Museum, to name a few. Such a treat for culture vultures! Find out about the complete list of museums here. The good news is that entry fees into most museums are not very expensive; I remember paying 8 euros for Anne Frank and 17 for Vincent Van Gogh. 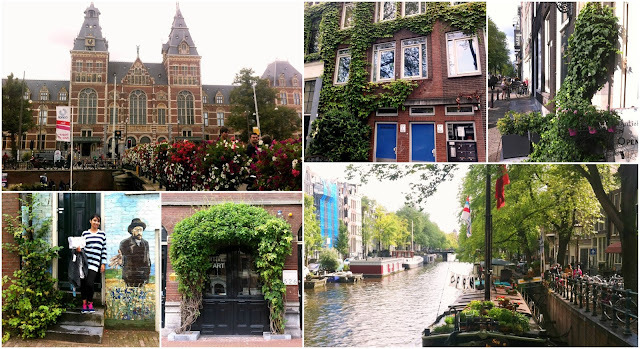 To learn more about Amsterdam, read this post of mine with some interesting trivia of this picturesque and culture-heavy Dutch city. While you're there, don't forget to use the official #iamsterdam hashtag on your social media posts...just because!